Is Apple Admitting a Problem With iMac Monitor Yellowing? Apple isn’t saying much, but it has finally pledged to support its owners failed products. “The ultimate all-in-one. Now with the ultimate display…Faster processors…Faster Graphics…” Apple’s description of its new iMac, first released in October make it sound like every computer user’s dream machine. Unfortunately, that dream fast became a nightmare, when iMac purchasers discovered a plethora of quality control problems, including cracked screens, glitchy graphics, non-booting systems, and more. But none of the problems was quite as strange or as prevalent as the case of the yellowed monitors. It wasn’t the LEDs used in the backlighting, tests showed — it seemed to be quality issues either in the LCD panel itself or the cabling. Of course Apple, known for being one of the most innovative and forward thinking companies in the industry, would help customers with their problems, right? Nope. Apple kept quiet on the issue even as its customers pleaded with it to listen. The silence continued as a reports piled up. They gained a personal advocate in the news industry when Gizmodo’s Mark Wilson suffered a string of yellow lemons in his search for an Apple desktop. Mr. Wilson gave a voice to the growing frustrations of the Apple masses. Then came some small signs of progress. Despite resistance to refunds in the U.S. (Apple service representatives insisted that users get their units “repaired” — often returning them still yellowed units), in the UK Apple was quietly offering users extra cash to take yellowed units off their hands. We’ve addressed the issues that caused display flickering and yellow tint. Customers concerned that their iMac is affected should contact AppleCare. AppleCare is the name of Apple’s customer service that it offers with its computers. Customers purchasing Macs get 90 days of free phone coverage and a year of hardware coverage (if Apple acknowledges the issue, that is). Apple customers can opt to purchase an extended three year coverage plan. Apple shut down production of the top seller in January, only to restart it again early this month. Since, customers have continue to report discovery yellowed monitors, albeit at a lower rate. 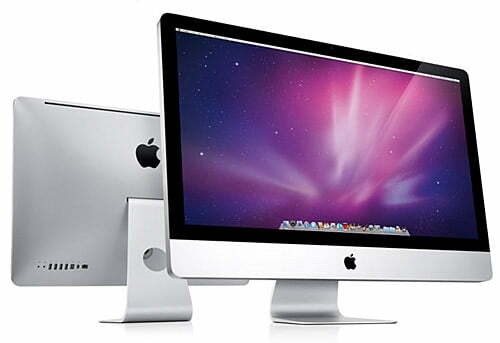 Some customers have received three or more yellowed iMacs. Now at least iMac buyers can be rest assured that if they test their new units and discover yellowing that Apple will acknowledge the problem and offer them a replacement. U.S. customers can reach Apple Care at 1-800-APL-CARE (1-800-275-2273).